Happy (Late) St. Lucia Day! This holiday is very special in Kirsten’s stories. In Kirsten’s Surprise, Kirsten, with the help of her cousins, dresses up as St. Lucia and serves the traditional treats to her family. The gown above is the one AG sold. Since we don’t have Kirsten’s St. Lucia gown, I decided to make one! I used Josefina’s blouse from her feast outfit and a red ribbon we had lying around. For the wreath, I scrounged in the basement and found some faux leaves that twine around each other nicely. The candle is just from a box. This is the result! It’s not a perfect match, but it will do. 🙂 A VERY IMPORTANT TIP: If you use real candles for a doll’s St. Lucia outfit, do NOT Light the candles!!!! You could damage your doll. Do you celebrate St. Lucia day? 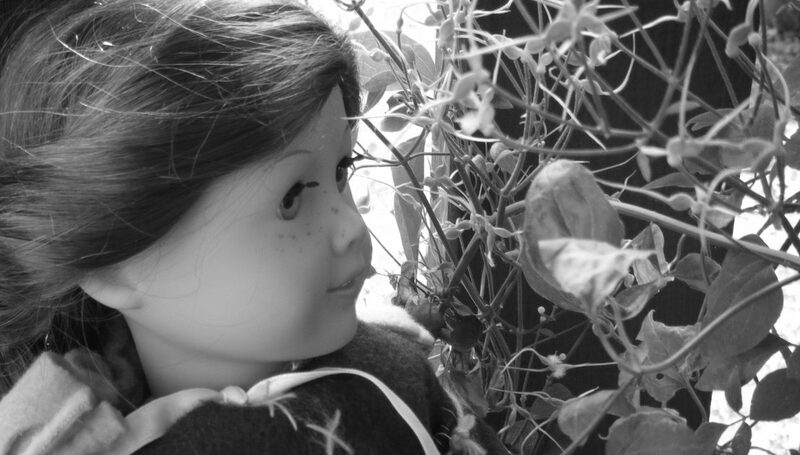 I took my dolls Julia and Nellie out for a photoshoot today! They both have freckles and were wearing flowers, hence the title. Anyway… on to the photos! We’re finally getting some sprouts! Guess who’s excited for Christmas! American Girl is donating a doll to a girl at a hospital for every doll you purchase from November 6-30. I think that’s a really fun idea! Especially for girls who are going to be in the hospital over the Holidays. I probably won’t get a doll, but if you were thinking of getting one, now would be the time! Go to: http://www.americangirl.com/general/giveafriend and watch a cute video, learn more about the cause, and more!